Infrared cameras are used to look for changes in heat signatures. We can use the data to determine areas where there is heat loss, missing insulation, wiring issues or moisture penetration. 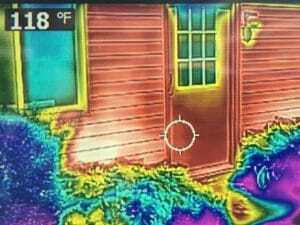 Infrared does not look through a wall, it just sees the heat pattern on a wall. Can be used to determine where piping or duct work is located in a slab, before undertaking remodeling or maintenance work. Can tell if there is water intrusion behind a wall, or find a damp area of flooring that appears visually dry. We do not charge for this scan when used at the Inspectors discretion, if you need a specific scan of an area you suspect has a problem just let us know.